Allergen immunotherapy was introduced by Leonard Noon 100 years ago and is the only disease-modifying treatment for allergic individuals (Allergy, 2012). 27 patients with rhinitis with or without intermittent asthma and allergy to Alternaria were enrolled in this study. 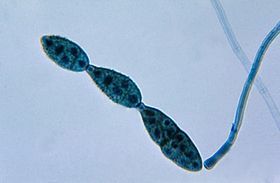 Alternaria sp. Image source: Wikipedia, CDC, public domain. Alternaria is a genus of ascomycete fungi that are major plant pathogens. They are also common allergens in humans. After a baseline season, SLIT or matched placebo was given for 10 months. After treatment, patients receiving SLIT had an improvement in symptoms and a reduction in medication intake. Skin prick test reactivity decreased only in the SLIT group. No change was seen in specific IgG4 levels in the 2 groups, whereas Alt a 1 specific IgE levels increased in the active group. One patient in the active group reported oral itching and conjunctivitis at the beginning of treatment. SLIT seems effective and safe and may represent a valuable therapeutic option in respiratory allergy due to Alternaria. Mechanisms of allergen-specific immunotherapy (click to enlarge the image). Sublingual immunotherapy for Alternaria-induced allergic rhinitis: a randomized placebo-controlled trial. Cortellini G, Spadolini I, Patella V, Fabbri E, Santucci A, Severino M, Corvetta A, Canonica GW, Passalacqua G. Ann Allergy Asthma Immunol. 2010 Nov;105(5):382-6. Epub 2010 Sep 26.